A *hard* lesson I learned was that when training for a marathon, you need to work on overall - body strength and conditioning, not just running. During the past 4 weeks I've been participating in the BOSUStrong and SweatPink challenge. Yoga has been a life saver with running. I fell in love with yoga years ago when training for my first marathon. It worked then and it continues to work for me. I've come to find a few poses that are my go-to poses to help me feel stretched and centered all at the same time. 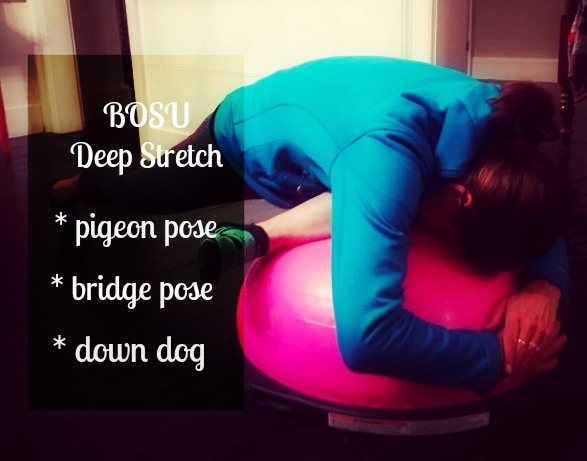 My first challenge was to find great yoga poses that I could do with the Bosu. Challenge accepted. My new BOSU was helped me get a deeper stretch with these poses. You don't have to spend hours a day doing core work. All you need is 5 minutes and a BOSU and you've got yourself a great plank workout! Add in a dog or two and you've got yourself great photo-bombing and distractions as well. Perhaps our dog is just as obsessed with tennis balls and you'll get the pleasure of having yellow tennis balls thrown at you while you work out. Keep it simple!!! Lunges, squats and mountain climbers are my favorite leg strengtheners. Easy and not time consuming either. I usually do 1 minute of each, recover, then repeat. Do you have any favorites? What would you do if you had a Bosu?